Electronic-cigarettes, are often touted as being a “safe” alternative to conventional cigarettes. But are e-cigarettes really any safer? Enticing flavors and aromas lure you into believing they’re a healthier alternative to conventional cigarettes. But the truth is there’s a growing concern about the danger of liquid nicotine — no matter how you smoke it. Are e-cigarettes simply giving a bad habit new life? Let’s see what experts have to say. 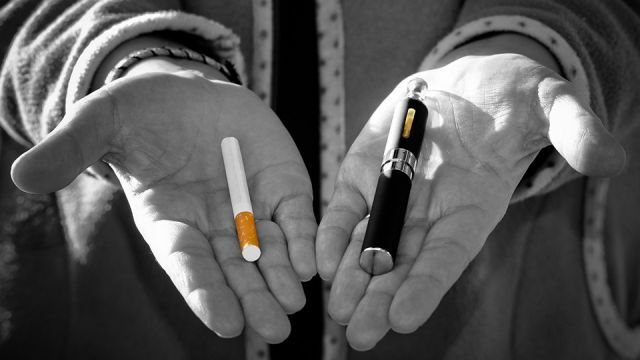 E-cigarettes are battery-operated devices that are shaped like cigarettes and provide a way to inhale nicotine. The difference, though, between e-cigarettes and traditional cigarettes, is that e-cigarettes work by heating a liquid cartridge containing nicotine, flavors, and other chemicals into a vapor. And, since e-cigarettes heat a liquid instead of tobacco, what is released is considered smokeless. But does that mean it’s without health risks? Well, according to a new study conducted by researchers from the New York University School of Medicine, e-cigarette users are possibly putting themselves at risk for developing heart disease, lung and bladder cancers, just like traditional cigarette smokers. Nicotine is a toxic, colorless or yellowish, oily liquid that is the chief compound of tobacco. What makes it so attractive to smokers is that in small doses it acts as a stimulant. But in larger amounts it blocks the action of autonomic nerve and skeletal muscle cells. Until recently, it was thought that nicotine was not cancer-causing or particularly harmful on its own — hence the power of e-cigarettes. But nicotine is highly addictive and exposes people to the extremely harmful effects of tobacco dependence. E-cigarette smoke (ECS) delivers nicotine through aerosols without burning tobacco. So, promoters of e-cigarettes suggest that ECS is noncarcinogenic. But that’s simply not true. During the study, researchers exposed mice to e-cigarette smoke for 12 weeks at a dose and duration equivalent to light e-cigarette smoking for 10 years in humans. By the end of the study period, the smoke had caused DNA damage in the mice’s lungs, bladders and hearts, as well as limiting lung proteins and important DNA repair. Are you being poisoned by nicotine? If you’re using an e-cigarette to smoke nicotine then you could be setting yourself up for nicotine poisoning. We know how highly addictive nicotine is, and the hard truth is the more you vape nicotine the more addicted you’ll become. The more addicted you become the higher the chances of being poisoned. And, if you don’t think there are any long-term effects of nicotine poisoning then think again! Evidence points to the “almost unambiguous” conclusion that nicotine can convert to a carcinogen once inside the human body, says Moon-shong Tang, NYU study author and professor of environmental medicine and pathology at NYU School of Medicine. “Nicotine is not as innocent as conventional wisdom thinks,” said Tang. With the growing popularity of vaping nicotine through e-cigarettes there has been an increase in reported cases of poisoning. In fact, liquid nicotine exposures continue to concern poison specialists according to the American Association of Poison Control Centers. If you use liquid nicotine, take precautions to protect your skin when handling products. And keep your products, out of sight and out of the reach of small children. Furthermore, after using liquid nicotine, dump it in the garbage to prevent your pets and children from becoming exposed to the residue or liquid left in your e-cigarette. Over half of reported exposures to e-cigarettes and liquid nicotine occur in young children under the age of six. In fact, it’s reported that some children and even toddlers who come in contact with e-cigarettes or liquid nicotine have become very ill. Some children have even required emergency room visits because of nausea and vomiting. Is vaping really worth risking your children or pets lives? Nicotine poisoning is basically caused by overexposure to nicotine. And it can happen through inhalation, ingestion or absorption through the skin or eyes. Overdosing on nicotine depends on factors like body weight and the source of the nicotine. Researchers from the Department of Pharmacology and Toxicology, Karl-Franzens University, Austria suggest that the lethal dose of nicotine for adults is 50 to 60 milligrams. This means that approximately five cigarettes or 10 milliliters of a nicotine-containing solution could be fatal. But barring death, which is relatively low for nicotine poisoning, what are the symptoms? Extreme symptoms may include seizures, coma, breathing difficulties and respiratory failure. So, in the long run, it looks like e-cigarettes have simply replaced one evil with another. You may think you’re doing your body a favor, but you’re not. Take it from someone who has witnessed, firsthand, the long-term and deadly effects of nicotine dependence. Trust me, it ain’t pretty or cool, and it doesn’t end well — no matter what they try to sell you. Hey Buddy!, I found this information for you: "If You Smoke E-Cigarettes Every Day, The Real Danger Is Not What You Think". Here is the website link: https://www.thealternativedaily.com/new-study-shows-danger-of-e-cigarettes. Thank you.